"The New Zealand Official Yearbook has provided a comprehensive statistical picture of life in New Zealand since 1893. 'Handbooks' and 'Blue books' of statistical information go back even further." "'Where data meets design.' Visual communication is growing in importance; infographics and data visualization are two visual forms designers and statisticians use to communicate to the masses complex and often hard to understand concepts." 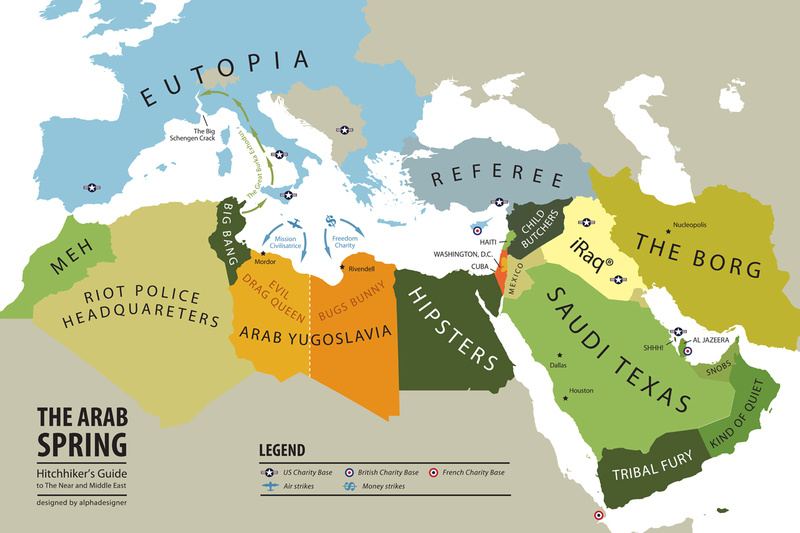 "A map collection depicting various national stereotypes in Europe and the world taken from the Mapping Stereotypes project by Yanko Tsvetkov." 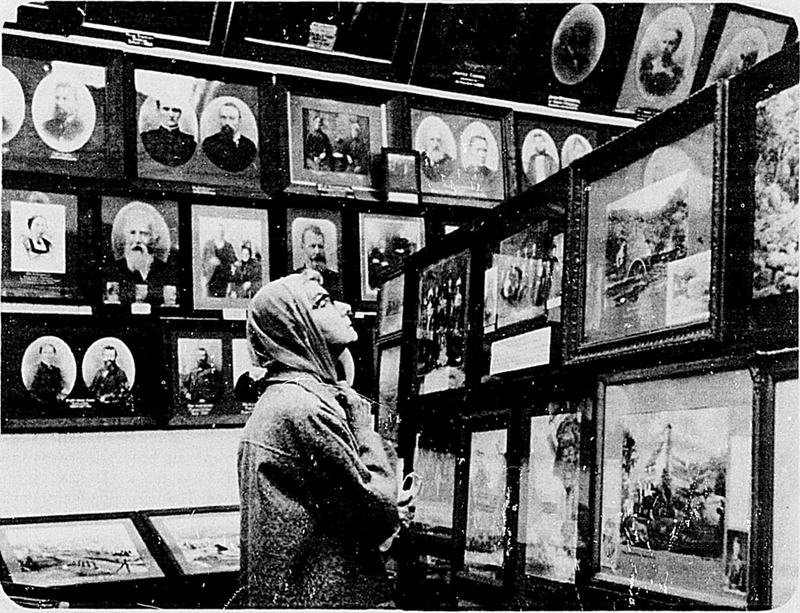 Fig.1 Yanko Tsvetkov. 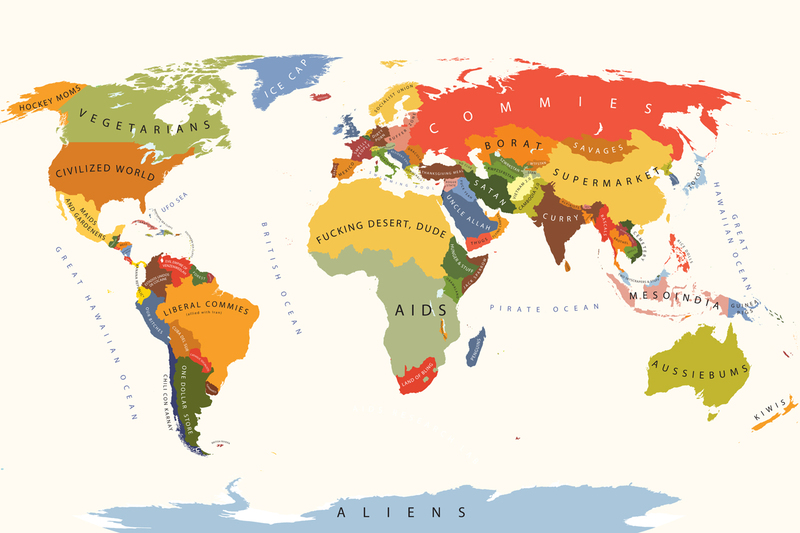 "The World According to USA"
Fig.2 Yanko Tsvetkov. 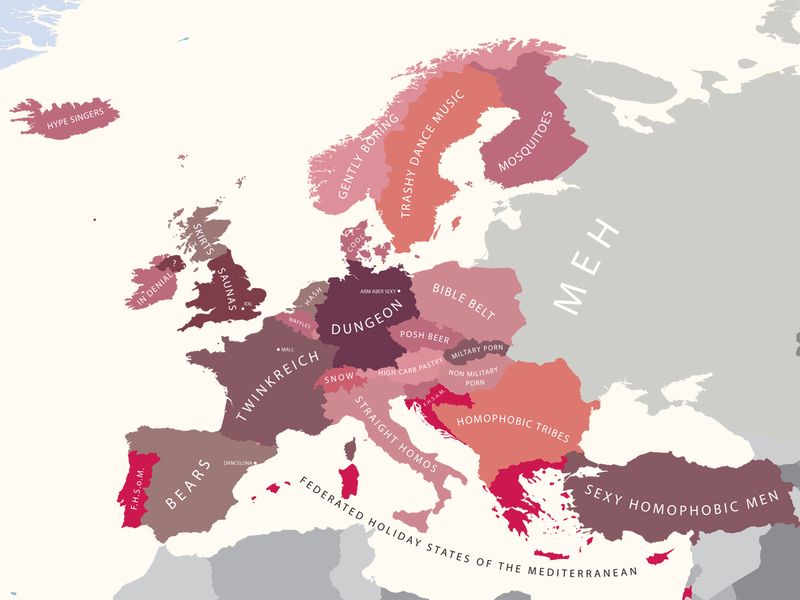 "Europe According to Gay Men"
Fig.3 Yanko Tsvetkov. "Hitchhiker's Guide to The Arab Spring"
"Pictures had been used for the purpose of conveying information long before the development of Isotype. 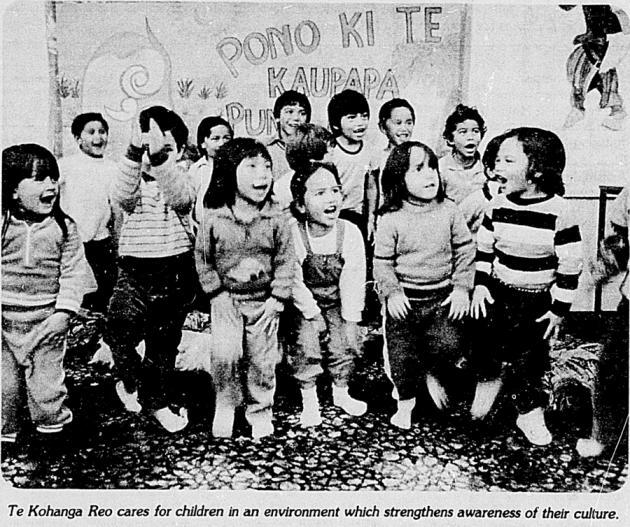 Picture language preceded the evolution of writing and a number of societies developed their own sets of rules in order to aid communication through pictures. Since the evolution of alphabetic writing in the western world pictures have, generally speaking, played a subordinate role to writing as far as communicating information is concerned. It is true that until the middle of the nineteenth century paintings usually told a story of some kind and relied on conventions of symbolism, composition, gesture and facial expression to convey their meaning; but there were few attempts to build up comprehensive picture languages before the present century. Comenius was not concerned with the structure of pictorial language, and even William Playfair, who developed a visual approach to the representation of quantities in the late eighteenth century which he called 'lineal arithmetic', does not appear to have adopted any firm conventions of treatment. 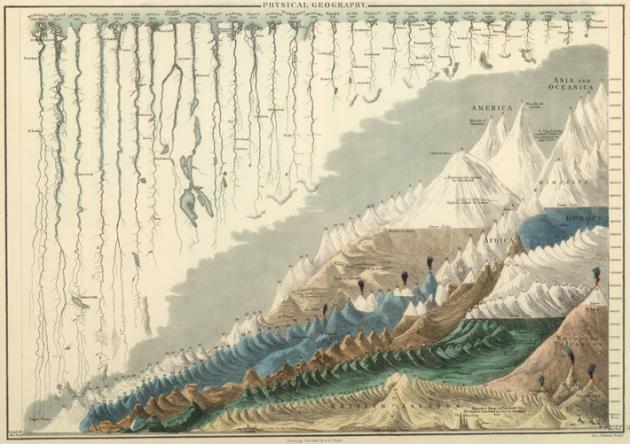 Similarly, the numerous nineteenth– and early twentieth–century designers who presented statistics and other information through pictures appear not to have considered the need to work out overall approaches. By the end of the nineteenth century many novel approaches had been adopted in the field of picture language but, in general, it was as chaotic as written language was in pre–classical times when early Greek and Latin characters assumed a variety of orientations and the direction of reading and writing were not fixed. The real significance of Otto Neurath's contribution in the field of picture language is that he saw the need to establish a set of conventions in order to make communication easier and more effective. These conventions were developed over a number of years and were only settled upon after being tested thoroughly through use. However, two basic rules were formulated almost from the beginning of the Isotype Movement. The first of these related to the presentation of statistics by means of pictures and held that a sign should be used to represent a certain amount of things and a greater number of such signs a greater amount of things. The second was a general rule that perspective should not be used. Perspective involves making objects of the same size smaller or larger according to their distance from the viewer, which means that they cannot easily be quantified; when something needed to be shown in three dimensions the Isotype team used models or isometric drawings. In accepting these two basic rules Otto Neurath was returning to the conventions of some of the earliest formalised systems of communication, and particularly to Egyptian wall painting and hieroglyphs which had influenced him profoundly. Thereafter a number of other rules and conventions were established by Otto Neurath and his team. 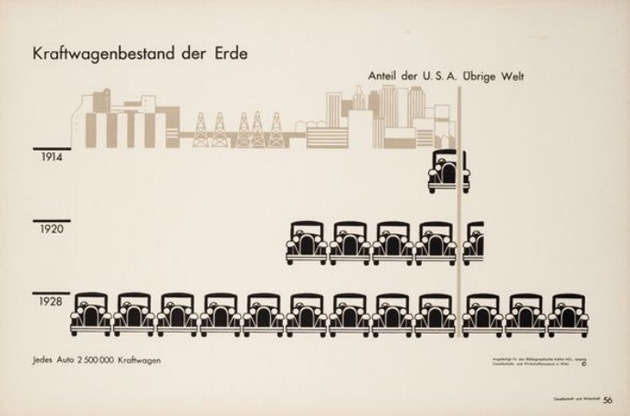 They are described briefly in the section of the catalogue called 'Principles of Isotype', and in more detail by Otto Neurath in his book International picture language." Fig.1 Chart of motor vehicles in the United States and abroad. From Gesellschaft und Wirtschaft, 1930 (courtesy MAK Center). "If the world were a village of 100 people, what would its composition be? 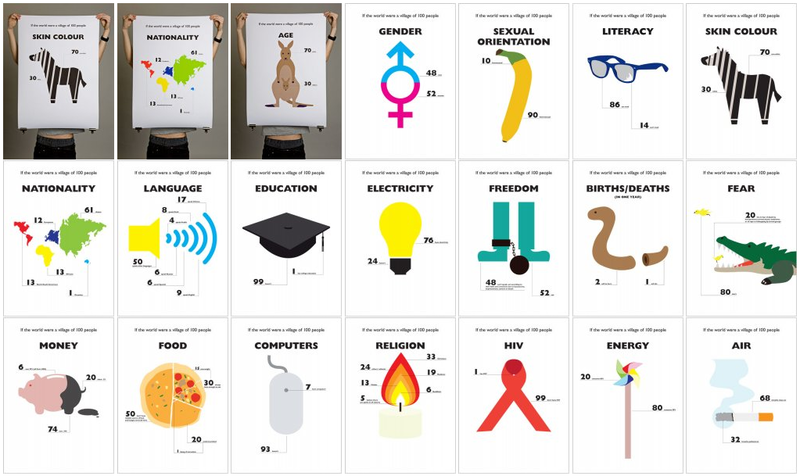 This set of 20 posters is built on statistics about the spread of population around the world under various classifications. 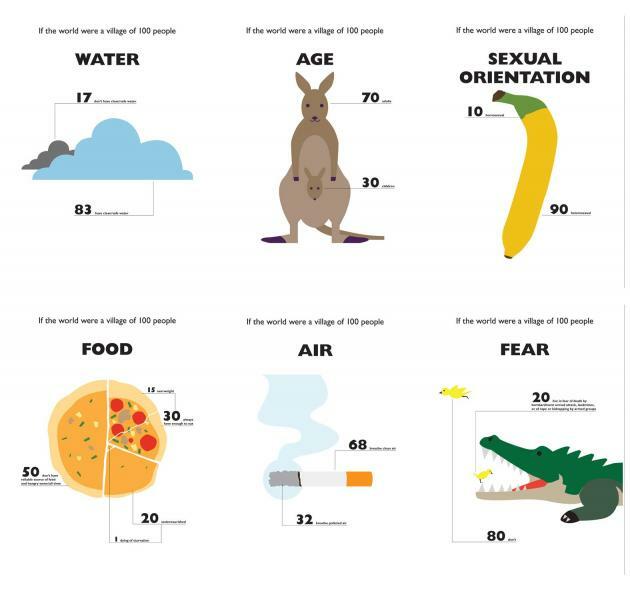 The numbers are turned into graphics to give another sense a touch – Look, this is the world we are living in."